After 56 years God's Plan has now been completely updated and given a new bold typesetting. Don't worry though... Not one word has been changed from Dake's original edition. Description: A Storehouse of Scriptural Knowledge! A doctrinal study of the Plan of the Ages consisting of 52 lessons with 26 supplemental faith building chapters added. Originally designed as a 3 year Bible course in 1948, and now has circled the world as a classic theological work on the simple and plain literal truths of the Bible. Throughout nearly sixty years of ministry, Finis Jennings Dake passionately pursued the literal truth of Scripture. God's Plan For Man contains the very heart of his life's work. Originally designed as a correspondence course, God's Plan For Man is equivalent to a three-year Bible College program. As such, it is highly interactive and intended for serious study. In this comprehensive volume, Dake unfolds the plans and purposes of God from the eternal past to the eternal future, exploring biblical prophecy and the privileges of life in Christ. He systematically discusses the nature of the Bible, principles of biblical interpretation, the Trinity and much more. In God's Plan For Man, Dake writes with a pastor's heart. His aim is to encourage faith. The result is a balanced diet that satisfies both heart and mind. Now, with an expanded Table of Contents and Index created by noted Dake Scholar Rev. Leon Bible, it's even easier to access this massive work. Do you have an older version of God's Plan for Man? If so you are missing 100 new pages of information that is included in the Newest edition. If your edition of God's Plan looks like this you have the older edition. Click here to see the older edition. 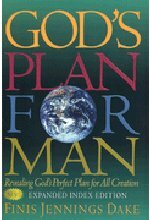 Dimensions: (Length x Width x Height): 9.32" x 6.35" x 1.63"
Click Here to read the Table of Contents of God's Plan for Man.